Mud tank is a important part for drilling site, AIPU delivery 7 sets mud tanks to drilling site for a 1000HP rig solids control system. The mud tank layout and pipeline arrangement is customized as per drilling site space and drilling requirement. 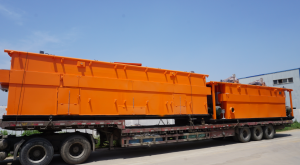 The mud tanks contains centrifugal pumps, mud agitators, mud guns, mixing pumps, mixing hoppers as well as drilling mud treatment equipment like shale shaker, mud cleaner, vacuum degasser and decanter centrifuge. The clients ordered US equipment and installation them on AIPU mud tank for final commission before delivery. 1. Mud tank body is made by steel plate, H beam, square pipe, grattings, etc. The standard tank wall is 8mm thick steel plate and tank bottom is 10mm steel plate. The tank wall sit on a H beam made skid with crane loading eye pad. 2. Steel square pipe will be welding at each corner and tank line on top to make strong tank, the top square pipe will be working as mud gun line and water line by 2 or 3 inch ball valve control. 3. Round pipe will be working as mud pump suction line, mixing pump suction line and mixing discharge line with butterfly valve for control. The pipe line arrangement will make it suction at any of the clean mud tank and discharge to any of the clean tank too. 4. Centrifugal pumps and mud agitators will be installed as per request, normally desander and desilter cone feeding pump will sit on shaker tank skid and mixing pump will sit at mixing tank skid with mixing hopper. AIPU build customized mud tank with different size, mud storage capacity, pipeline arrangement and equipment selection. The tanks configuration similar but it’s design can be very different and different clients always special request somewhere to make tank different with each other. Please contact us freely for more info on tank design.